Hysteroscopy is an surgical procedure in which a small telescope (the size of a pencil) is used to inspect the inside of the uterus. A camera is attached to the end of the telescope and the image is viewed on a video monitor. Surgery is carried out while looking at this monitor. This is what the telescope looks like and it is inserted thru "sheaths" of different sizes. The first step involves cervical dilatation. The cervical opening must be enlarged to allow passage of the hysteroscope. Once inside the uterus, gas or fluid is used to distend the cavity. Your gynaecologist may then inspect the uterine walls, openings of the fallopian tube, and overall architecture of the womb. Hysteroscopy may be recommended for evaluation for abnormal uterine bleeding recurrent pregnancy loss and recurrent abortions. Diagnostic hysteroscopy can be performed with a smaller instrument. This procedure is generally shorter and can be done under mild sedation or short general anaesthesia for better comfort The procedure is quick and inexpensive. Operative hysteroscopy is performed under general anaesthesia. This will allow the physician to both diagnose and treat most findings, which are encountered at the time of the procedure. The Operative Hysteroscope has ports, which allow the physician to insert operating tools, such as, scissors, cautery devices or a laser fiber which may be used to resect or cauterize specific abnormalities under direct visualization. The hysteroscope is also valuable in treating some forms of tubal occlusion. Many patients with a blockage in the fallopian tube may have an obstruction at the junction between the uterus and fallopian tube. The Hysteroscope is used to pass a small catheter through this contracted area under direct visualization. Occasionally, scar tissue can be disrupted and allow passage of sperm as the result of the procedure. A physician will be able to evaluate the cervical canal, the contour of the uterus, and the quality of the endometrial lining. The tubal ostia are the openings of the fallopian tube into the uterine cavity. They should be easily seen with the hysteroscope. Hysteroscopic resection of septum- To cut the septum in uterine cavity. 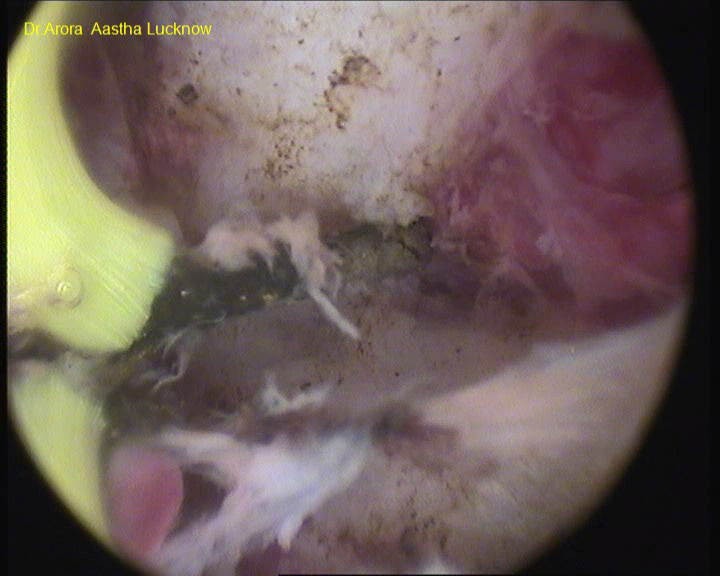 Hysteroscopic resection of polyp- To remove polyp from uterine cavity which can be the cause of infertility. Hysteroscopic removal of foreign body- To remove foreign body like intrauterine contraceptive device from the uterine cavity which cannot be removed by a simple D and C.
Hysteroscopic removal of retained products of conception- To remove the products of conception in the uterine cavity. Complications are infrequent from hysteroscopy. Some patients may experience mild cramping. This usually is the result of the need to dilate the cervix for insertion of the scope. In general, patients are able to return to their normal activity level in 1-2 days after surgery. The possible risks of hysteroscopy include bleeding, infection and uterine perforation. Fortunately, these risks are infrequent. Occasionally, your physician will utilize a simultaneous Laparoscopy to aid in the prevention of uterine perforation if extensive hysteroscopy surgery is planned. Why is hysteroscopy better than a plain D & C? Nowadays it is rare for a D & C to be done alone. It is usually combined with a procedure known as a hysteroscopy. This is because it is conclusively proven that a D&C [which is really a "blind" procedure] even in the best of hands gets only about 50% of the lining of the uterus while there may be a disease in the remaining portion which has been missed. A hysteroscopy allows the gynecologist to view the inside of the uterus and take a biopsy from the area which is worst affected and to localize the area and extent of the disease too. More expensive and huge investments in instrumentation leading to potentially higher cost per surgery.